Replies: 66 (Who? ), Viewed: 73329 times. Doing all the things, and *mostly* not failing. #1 9th Apr 2008 at 5:17 AM Last edited by Phaenoh : 17th Oct 2017 at 5:35 PM. This tutorial is going to teach you how to recategorize Maxis content. I will be covering objects. First a little heads up. We will NEVER be editing the Maxis program files. ALWAYS create a copy of them for editing. It is possible (but not recommended) to do your editing directly in the program files, but there are two downsides to this. If you mess it up, and you don’t have a backup and need to replace the files (for most people, that means a full game reinstall). The other downside is that when you get a new Expansion Pack, it will overwrite all your changes and you will have to start all over. That happened to me. I was editing the BV object files and when I installed FreeTime I lost all that. It really sucked. Though it was a good thing for you guys, I had to make a new version (the way I’m teaching here) and was able to upload that for you all. If you found this tutorial to be a bit daunting, my catalog edits (objects) (clothing) are available for you instead. Everyone clear on this? No editing game files!!! Requirements: Paper, pencil, SimPE and basic knowledge of it. If you don’t understand some of the the SimPE, go look them up in How To Use SimPE type tutorials. 1)	Grab a piece of paper and a pencil. (For those who like to use their computers as note takers, this won’t work as well unless you LOVE pressing Alt+Tab six thousand times. Start the game. Go into Buy Mode and start writing down the names of every object you believe to be in the wrong category. Put a little arrow�* next to it and write down where you would prefer it to go. Take your time, go through each category. (This tutorial can also be applied to regular CC, so if you have some of that in the wrong categories too, you can note them as well, but put a little star* by them to remind you that they are CC. When editing those, skip to step 5) A few of the Build Mode categories can be rearranged as well. 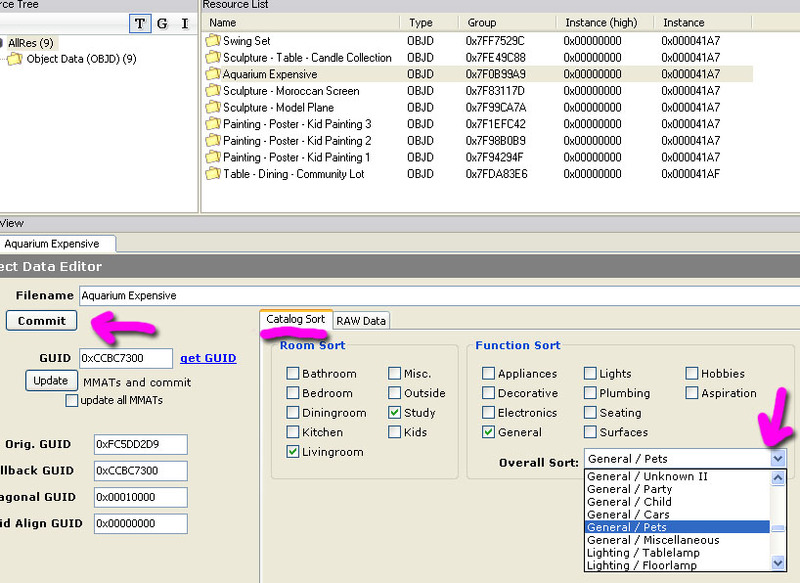 Plants, and some parts of the miscellaneous tab can be regrouped or added into. After you have all of that accomplished (I filled an entire page, 2 columns.) You should exit the game when you are done. 2)	Start SimPE. Open the Object Workshop. (There are a couple of different methods for finding all the items, but I found this one to be the best) Find the first item on your list and ‘Clone’ it. Default cloning settings are almost fine. You need to untick the first option. We DON'T want it to ‘Set Custom Group ID’. As Numenor has pointed out, it will go much faster if you make these changes too! Not needed with Numenor's suggestion: It will then give you the option to change the description, but since we won’t be keeping this file, changing it would be pointless. Then the Scenegraph Update wizard will show up, again, changing things is pointless. SimPE is then going to ask you to save it as something. My standard procedure is calling it delete.package and saving it to my desktop. Once you have the package created and loaded and saved, find the Object Data (OBJD) and Extract it (right click, choose ‘Extract’). 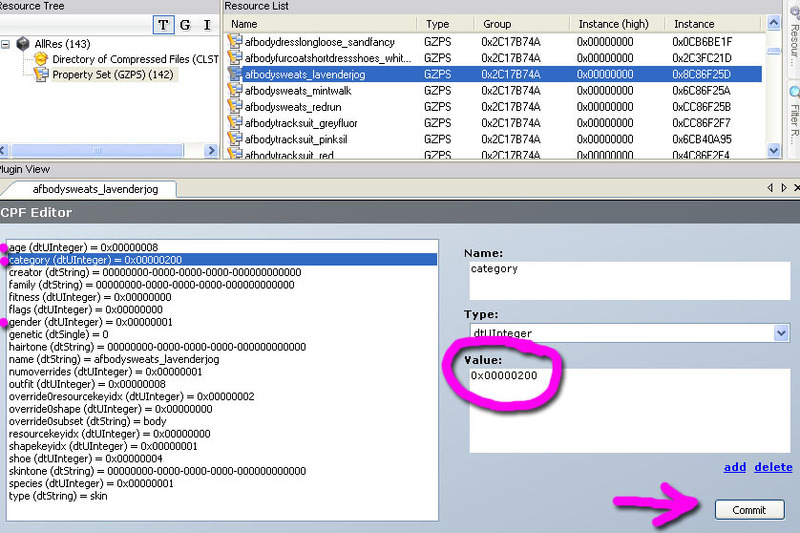 If your object has more than one OBJD, pick the one without the numbers next to it. Create a folder on your desktop called something like ‘Buy Mode Recat Project’ and save the sucker in there. You don’t have to bother with renaming it. ‘4F424A44-00000000-7F2F87A2-000041A7.simpe’ is fine. 3)	Repeat for all objects on your list. 4)	Create a new package. Right click ‘Add’ and add in all those OBJD files that are in that folder we make. Single click on the first one in the list and shift click on the last one and you can do them all in one step. Save this file as YourName_BuyModeCatalogEdit and follow the install instructions here (This has a hard time installing sometimes, it’s been trouble shot there already). 5)	Click on the first OBJD in your list. In the Plug-In tab view, click Catalog Sort tab if it isn’t already. Check and uncheck those check boxes to your hearts desire. Make sure you also change the drop down box to your new category. When I did mine, I only changed the drop down box. Hit commit. Lather, rinse and repeat for all OBJD. Save. You are done! Go test it in the game! To move things around in build mode, its a little more complicated. You need to go into the RAW DATA tab and edit numbers in there. Please note, these are HEX values! 6)	To make this compatible for uploading, you need to group these objects into the Expansion Pack or Stuff Pack they came with. Click on the Raw Data tab. Scroll down until you see the Valid EP Flags 1 and 2. That number specifies the pack. Create a package for each pack. DON”T CHANGE THE NUMBERS! You are done! Go test! I've included a pdf version complete with pictures of this tutorial for your offline enjoyment! Any updates or changes I've been making to the online version are NOT included in the PDF, however. If you have any trouble with the tutorial, reread the step, then ask questions. If it was helpful let me know! Like my work? Help me make a difference! Thanks for this tutorial. I already recatagorized all my clothing for a while. But i'm happy i can finally start on the other objects now. Oh and thanks for the pdf. I really appreciate it. Does this number work for both. I have the 2006 version does that mean all objects from this pack are considered to be 2006 or are some of them still 2005? And how can i tell which item is which version? Is it possible to extract the Object Data (OBJD) from the game files, similar to the clothing editing? 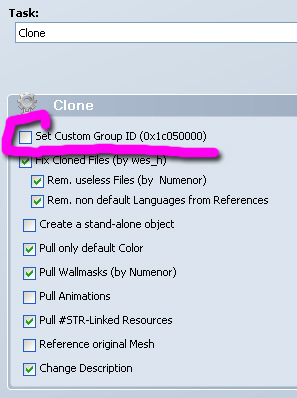 This would mean i would not have to create a clone package for every single object. Where would i have to look for these object data? I think this cheat requires pets, not sure. As for Holiday, the only way to figure out which is which is by trying them both in game and seeing which one shows up. If you don't really understand, try downloading my version of the Holiday edition you don't have and see what it does to your catalog. You will see some missing pictures. Delete it after you are done with it, it won't harm your game. Unless you really know when something came out its hard to find. Also, they aren't always named the same thing in the catalog, most times they aren't. Good tip about the cheat. I am always trying to remember what it is and never succeeding at it. I tested with both files, only 2005 and only 2006. My conclusion is i need both in my game. I didn't notice any missing pictures (i checked all categories). I have only the holiday pack 2006 installed but i have all objects listed in your original thread, those of the 2005 holidaypack are included in 2006. Only 2005 catalog edit: only the items you have listed as 2005 are moved and show correct pictures, the 2006 items are unchanged. Only 2006 catalog edit: only 2 items you have listed as 2006 are moved and show correct pictures, the 2005 items are unchanged. Both catalog edits installed: all items you listed as 2005 and 2006 are moved and show pictures. Since you only gave one number as ep flag, it doesn't matter if it came with 2005 or 2006. It would only matter if i wanted to share this file with someone who has 2005 because he/she would have the empty pictures you discribed. Something completely different now, I can't find the scarecrow anymore with your season catalog edit installed. The other objects that are changed with this file are ok so i think it has something to do with the buy/build mode change. I can still find it in the collections but not in gardening and not in deco. Wow Phae...great job on the tutorial. I will definitely be putting this to use this evening. Thank you so much for this tutorial. It's just what I need! #7 25th Apr 2008 at 4:29 PM Last edited by GrayDragonfly : 25th Apr 2008 at 4:36 PM. With objects, if it has two or more Object Data (OBJD) files do I need to extract all of them? An example would be the salon chair, it has five OBJD files. My Free Creations at TSR! "Who looks outside, dreams; Who looks inside, awakes!" No, only take the lead OBJD, the one without numbers. If you look at the others in the object with it, most of the time those are categorized as Misc. Deco, even if the object itself isn't a deco object. The catalog doesn't bother with the others, so you shouldn't either. Thanks! I kinda thought that might be the case but I wanted to ask first. The Maxis categories always pissed me off. Thanks for this awesome tutorial. Open up the CC package. There will be a OBJD file for it in there, if not, then you are looking at just a recolor and you need to edit the mesh file instead. -- I could have sworn there was one but I just can't locate it? -- I have put in my object edits with your ones (because I agree with the ones you've made already, this should be okay right? As long as both our object edits don't contain the same objects? -- What happens if you can't locate an object? I was looking for Flavorful Necessities and couldn't find it... I'll keep searching though maybe i'm going blind from all this editing. This message has been deleted by Ringo77. I noticed that you didn't include the Celebration Stuff EP. So I just wanted to mention that the Valid EP Flag for it is 0x0100 for anyone who can't find it or needs it. I'm having a problem also. I guess it's an issue with SimPE but I'm not sure. I have three objects that are showing up as costing 0. I noticed that that's the price in SimPE also. Is there a way to fix this? The three objects are BV's Zen Garden and Temple of Jumbok IV; and University's Spaceship Spacious Fountain. Oops, forgot Celebrations, I'll add it. Things that cost 0 aren't the 'real' object. There aren't the lead tile, its the one that doesn't have any numbers in it. They don't show up in the catalog, so don't bother trying to change it. Multi-tiled objects have more than one OBJD so you have to make sure you get the right one. #16 24th Jun 2008 at 8:08 AM Last edited by Numenor : 24th Jun 2008 at 8:14 AM. Just a useful hint (applies to OBJECTS only, refer to step 2 in the tutorial). Spiffy! Thanks Numenor, I'm still pretty unfamiliar with what all the check boxes do, so this is really helpful! Anything that makes it go faster, I like! 1. Is it possible to put an object into 2 locations? For example, putting the restorable car in both the hobbies->recreation and misc->cars bin. 2. How do you "delete" or "hide" objects from Maxis? There are some objects (like the egg chair) that I'll never use and see no point in having them show up. 3. Can you "delete" or "hide" clothes from Maxis? Plenty (if not most) I have no desire to see in CAS. 4. How can I "hide" floors and wallpapers? 2. Still working on that solution myself, but I believe the answer lies in how the extra tiles in multi-tiled objects are categorized. 3. Search for 'hiders' or set the flag of the outfit to be an odd number. How does this work if you want to make a hair style availble for children and toddlers that is normallyh only for teens and older. IE mohawks. Personally it's been making me nuts I want to make my kids as sims and can't they all have mohawks and are toddlers. There are also a few other hair styles I would like availble for my younger sims that the teens have. That can not be done with these methods, you need new meshes for each age, search for melodie9's hair age conversions, she has already done most of them for you. That's awesome. Thanks for sharing! - I have put in my object edits with your ones (because I agree with the ones you've made already, this should be okay right? As long as both our object edits don't contain the same objects? I have been trying to do the same thing and I can't get it to work. I started out by making some changes to your edits. That worked just fine. So here is what I did to try and add mine to yours. 11. right clicked and added all the basegame files that I extracted. When I looked for the changes in the game I found nothing had changed. I thought maybe I needed to say yes on step 6 instead of no. I tried that and the second object I tried to clone did not show up. The first one just stayed there. Would it help if I attached screenshots for the steps? I am going to try it again in the morning when I not so tired. Sometimes the Dragon wins and I AM the Dragon! I think I've got it. I was trying to add them to yours and then edit. So if I have this right, say I am working with NL. I clone and extract the files for my own edit. Create my own package for NL, make my changes. Then go back and extract those files and add them to your NL package? Quick update on catalog project. I organized the stuff that was really bugging me and then guess what. I found more stuff to organize. I have a feeling this is going to be a never ending project. But it is fun. Thank you for the tutorial.